Since I took full responsibility for my retirement investing strategy I’ve made some mistakes that have cost me money. I’m also sure that going forward I’ll probably make some more. What however is key for me is that if I make a mistake I never make that same mistake again. Over the coming months, if I get time, I will try and share some of these mistakes with you so that you can do your own research which hopefully might even save you some money. The first of these was not understanding how exchange traded commodities (ETC’s) work plus also not understanding the concept of contango that is associated with many ETC’s. When I put my retirement investing low charge portfolio together I decided that I wanted 5% of the assets to be invested in commodities. Using my usual low fee index approach to investing I went straight to an exchange traded commodity (ETC) that tracked an index and had allocations in energy, industrial metals, precious metals, livestock and agriculture. I held the ETC for 16 months before I realised that the investment wasn’t tracking the index at all. This was obviously partly caused by fees although as usual with my investment style these were as low as I could sensibly achieve but also by what I now know was contango. So what is contango? Well, my understanding is that typically when a product issuer sets up an ETC he doesn’t buy the physical product. I guess this is logical. Where is he going to store all the oil... How is he going to stop the corn from going rotten... Instead he buys futures contracts for the commodities that he is interested in. Now the problem begins because futures contracts have an expiry date and also on many occasions the further into the future the contract goes the higher the contract price (contango ). In practice it works as follows. The product issuer has a futures contract that is about to expire (say a barrel of oil). He therefore sells this contract as he doesn’t want to take delivery of the barrel of oil and he buys a new contract that is dated sometime in the future. When in contango the barrel today is priced less than the future barrel and so you incur a cost. I think of it as sell low and buy high which is not the best retirement investment strategy and certainly not the way to future financial independence. Of course there is always backwardation which can boost tracker performance but I’ll leave you to research this as I’ve decided to stay away from futures based ETC’s. 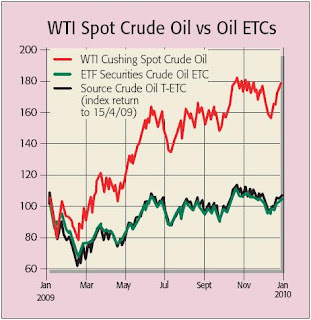 MoneyWeek (which is a publication I read every week) ran a good article on the 19 March 2010 entitled “Should you buy commodity trackers” which describes the whole phenomena in a little more detail than I have described above. Importantly though they also showed an example (the image above) of how damaging ETC’s can be to your wealth. 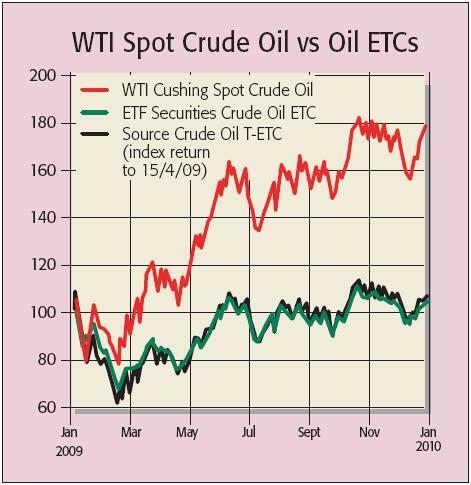 This shows the performance of WTI Cushing Spot Crude Oil which rose 78% in the 12 months to January 2010. This compares with the oil ETC’s which only rose a few percent. I think that image shows the issues with ETC’s very clearly. So what do I buy as my commodities play now? I’m keeping it really simple and buying a physically backed precious metals tracker which holds gold. Thanks so much for this - in my ignorance I was considering making the same mistake. No problem. Glad it helped you. If I can share data/experiences that encourage readers to go off and conduct research into areas they may not have considered then the Site is a success. It's not just ETCs, I've noticed a problems with ETFs too. Including a lack of transparency. In the worst cases, I see ETFs tracking the index and cannot see any evidence of where the dividend income is going. So I now go more for Investment trusts.